Time: The workshop will start at 9.300pm on June 18th and ends at 5:30pm on June 24th. Daily activities will start at 9:30am and finish at 4:30pm. All materials Included in the workshop’s cost. 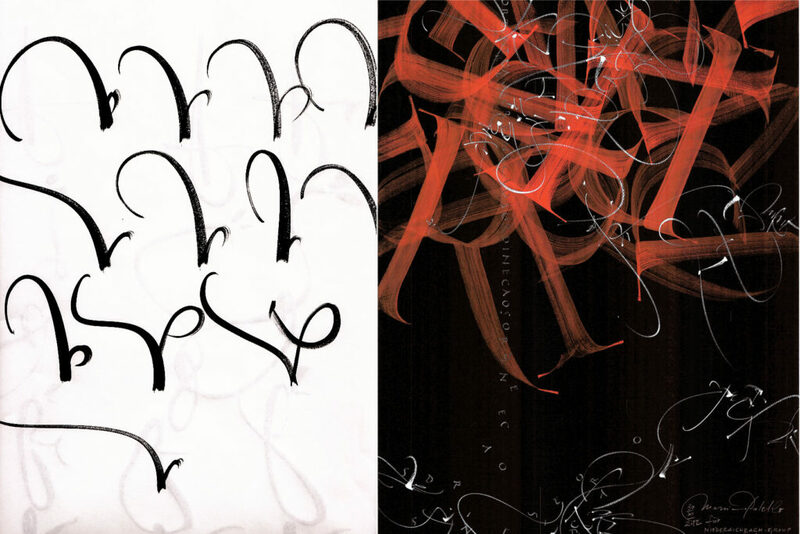 Course structure: 2+3 days with Massimo and the Typographic Archive of Turin. Leonardo Da Vinci’s writing has always been surrounded by an aura of mystery about his comprehension and codification. In reality, it’s a typical writing of the period (technically in between merchant and humanistic) used by many of Leonardo’s contemporary around the second half of the XV century. Therefore, its peculiarity and “mystery” comes only from the fact that Leonardo was writing in a reverse manner, a sort of mirroring and from left to right. Many academics concur in sustaining that this writing style was simply the result of Leonardo’s being mostly left-handed and, as result, he was using the other brain hemisphere in which resulting movement is exactly mirroring those of right-handed writers. The course does not focus on studying Leonardo’s reverse writing, but in its normal reading, even though some exercises concerning the use of the brain’s other side (thus using also the left hand) will help us not only in discovering how our movement works in relation to the other side of our brain but perhaps also in exploring a “new” gesture. After an in-depth study of Leonardo’s writing, commencing from a facsimile of the Code of Flight of Birds, preserved at the Real Library of Turin, but using the letters and writing rhythms, we will enter in a totally different context to develop a language of utilization that goes beyond the verbal meaning, to further develop a new one, autonomous, that will break all clichés that western writing imposes. This is the very same freedom that the Genius of Leonardo employed in its time by writing in reverse. The use and development – for example – of writing in VERTICAL, and thereafter in the composing space without any more lines and directions free from pre-set order, to develop a writing that DANCES freely in space in a rhythmic manner, similar to the trajectories of dancers in the scenic space. Thus, as a consequence, much attention will be placed in the composition and movement of the writing LINE in space, full and empty spaces, and on how this could change the very meaning of the visual message of the shapes of writing. The white space of a sheet, either small or large size being and the negative connotations often linked to the sense of void will all be main issues covered. Any mean and writing instrument will experiment in order to try and achieve our purpose. Please find here full program and cost. Plaese, find here a Japanese workshop and TEC presentation.